Eating out in Japan is always a fantastic experience - with so many different foods to try, practising your language skills, making new friends and generally having a great time, dining out in the land of the rising sun is always an event to enjoy. This article highlights features of some Japanese restaurants that you may come across, what to expect, and how to deal with them. In some small, cheap restaurants such as Matsuya, there is a service where you order with the ticket machine provided, which is usually near the entrance. The idea is that you take your time seeing what's available (photographs usually accompany the food on the menu), pay money into the machine, and select what meals and sides you'd like to order. 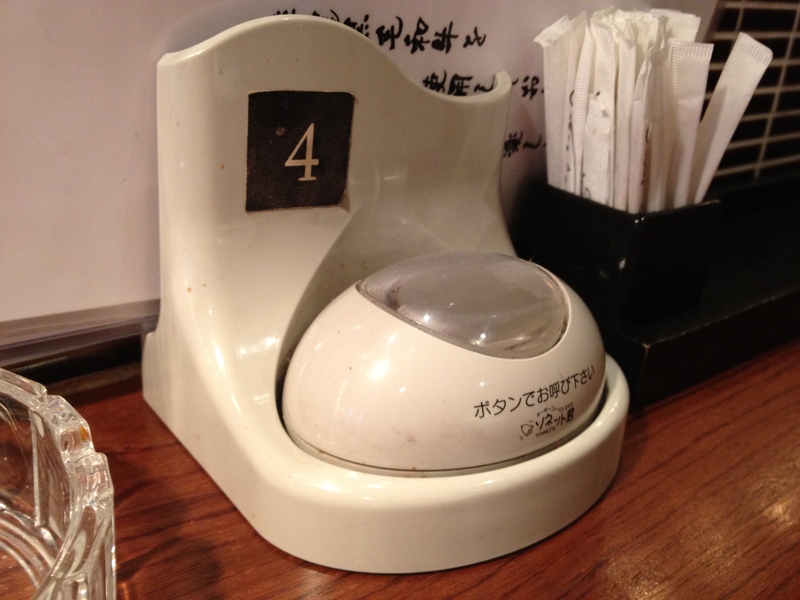 The machine will spit out a ticket, which you give to the restaurant staff after you sit down. This saves money on menus, and always means that the staff know you're ready to order when you've sat at your table, saving time for the both of you. It's an excellent method for small restaurants. Some advice for using the machines: just like a normal vending machine, make sure you know what you want before you press any buttons. If you've ordered several things - for example, a side of rice, check first that what you've chosen isn't already offered as a combo meal deal. If it is, you'll only have to buy one ticket (instead of one for your main and one for your side), and it will probably save you money as well. Another excellent method to save the waiters' and the customers' time is having a small button next to your table to get the staff's attention. By pressing it, your table makes a noise or switches on a light (or both), notifying the nearest waiter that you're ready to be served. Keep an eye out for these at restaurants. These save the staff checking up on you, offering you more drinks, or asking you too early if you're ready to order. They also ensure that you have as much time as you need to decide what you want, and you don't have to catch a nearby waiter's attention with your eyes or hands to be served or get your bill. These 'call buttons' are also sometimes available at bars, or restaurants open specifically for drinking. 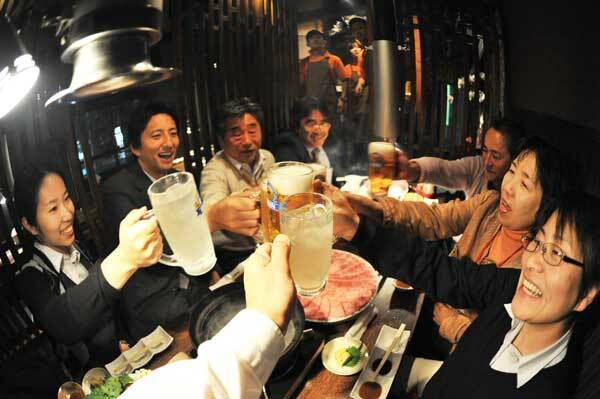 Tipping isn't mandatory in Japan, even if the staff have provided an excellent service. Unlike the USA, where waiters and waitresses may rely on tips, the Japanese will always provide change if you've paid too much for your meal. If you try to insist on giving a tip, you might be answered with confusion from the waiting staff. However, this will always depend on the restaurant and also the individual. Tip if you really want to, but waiting staff may not always be grateful or fully understand why you've decided to give them extra money. Never feel obliged to tip - it's not a common practice in Japan, even amongst tourists. Don't feel bad hanging onto your cash. Outside restaurants, you might sometimes see plastic (or 'fake') versions of meals they offer on tables or in restaurant windows. Japanese food is usually stunning in terms of presentation, and it's a good way for restaurants to show off what kind of food they offer with enticing, lifelike sculpures of their dishes without potential customers having to even enter the building. It's also a way to show their menu in more ways than in writing. Another great thing about this display is that it clearly shows what to expect if you do decide to go in and order something you saw. You know what kind of portions they give, and how much you're getting for your money. Chopsticks are used in Japan, and are often the only eating tools offered in restaurants. Sometimes waiting staff might offer a spoon or a fork to you (if you're foreign) when you eat at their restaurant. You can take this as you like, but many Japanese waiters will just assume you're a tourist who might not feel comfortable using chopsticks for foods like rice and noodles. If you'd prefer to have a spoon, but the waiting staff haven't offered you one, you may ask for one. If you don't speak Japanese, it's good to know that "spoon" in Japanese is simply that - "spoon". If you'd like to use manners, simply say "spoon o kudasai" (koo-da-sa-ee). There's no shame in using a spoon in Japan if you're more comfortable with it. However, using chopsticks is more authentic and traditional, and is always worth a try. If you're eating from a small bowl, remember to hold the bowl in one hand and eat out of it with the other, rather than picking food out of it whilst it's on the table (see picture below). In Japan, it's perfectly okay to quietly slurp when you're eating noodles - it shows that you're enjoying them, and also has a more practical reason - noodles can be hot when sitting in hot broth (such as in ramen or kake udon), and slurping allows cool air to enter the mouth at the same time as the noodles. You don't have to slurp of course, but don't be surprised if the well-dressed, respectable-looking salary man beside you is enjoying his food a bit more noisily than you expected. With these in mind, your dining out experience should be a lot easier and less stressful than it might otherwise be. In Japan, they are quite tolerant of foreigners, but it's always good to try not to gaijin-smash your way through a restaurant. Remember these tips, remember that Japan is extremely unique, and most of all, enjoy the experience!